Custom developed video conference solutions, try our demo service today! Move your team forward by engaging them with high definition video conference meetings. Ensure your communication is crystal clear. Be more efficient with your projects time. Business is faster then ever, make sure your communication tools are keeping up. Don't leave anything left misunderstood. Using live synchronous video for your meetings ensures all communication is clear. Body language consists of over 55% of our communication, which leaves many "unknowns" when it comes to email and strictly voice meetings. Your team will be moving at light speed using technology that facilitates face to face communication. Lengthy email threads are time consuming and unwanted. Address concerns immediately by studying participant reaction. Reach agreements quicker by bringing all parties together. Working remote is on the rise. Don't fall behind by loosing sight (literally) of the people you work with. Using video conferencing for meetings will build better relationships and in turn foster a collaborative working environment. Display live video for up to 25 participants. Screen share, annotation, remote assistance. Dial in by phone or use computer audio. Connect on all devices, PC, MAC, iOS, Android. We're very happy with the service provided and insight that you have shared throughout the development process. Very professional. We needed a custom solution to meet the needs of our growing association. You delivered an exceptional product that we're very proud to use daily with our colleagues. Amazing support helping us set-up and configure 3 room systems in one day! We appreciate your efforts, and look forward to setting up more with you soon. Wether your looking to integrate video conferencing into your application, set-up dedicated conference rooms, or get your organization meeting online, we can help! 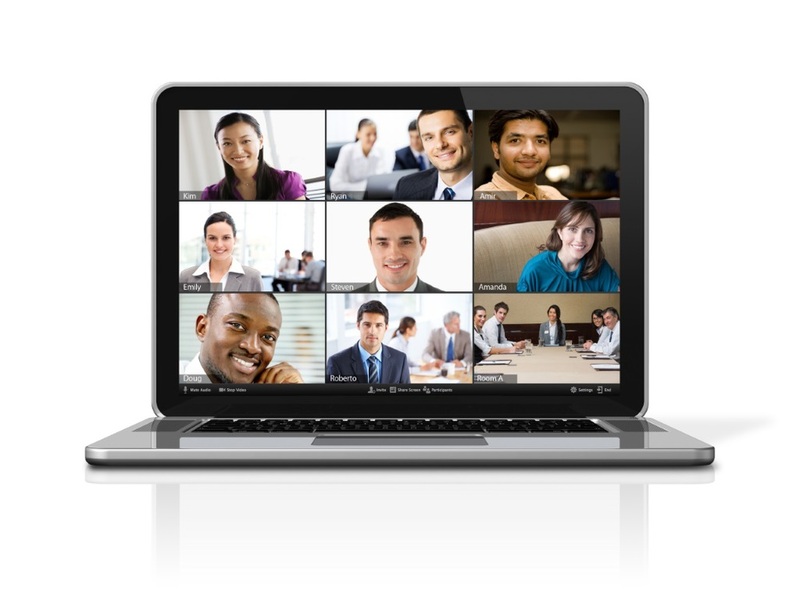 Use our video conferencing services powered by the latest in web communication technology. Alternatively, we can help you set-up and deploy a custom collaboration solution and provide on-going support. We can help you set-up and design your perfect conference room/s using software enabled room systems. Using the video conferencing API we can integrate this solution into your business applications. Using the latest in WebRTC solutions, we can help you build powerful communication tools into your app. You have questions? Let us help answer them. We respect your privacy. You will not be added to any list, this is stricly for starting conversation. What does your web based tool offer? A simple way to meet and collaborate with others online. 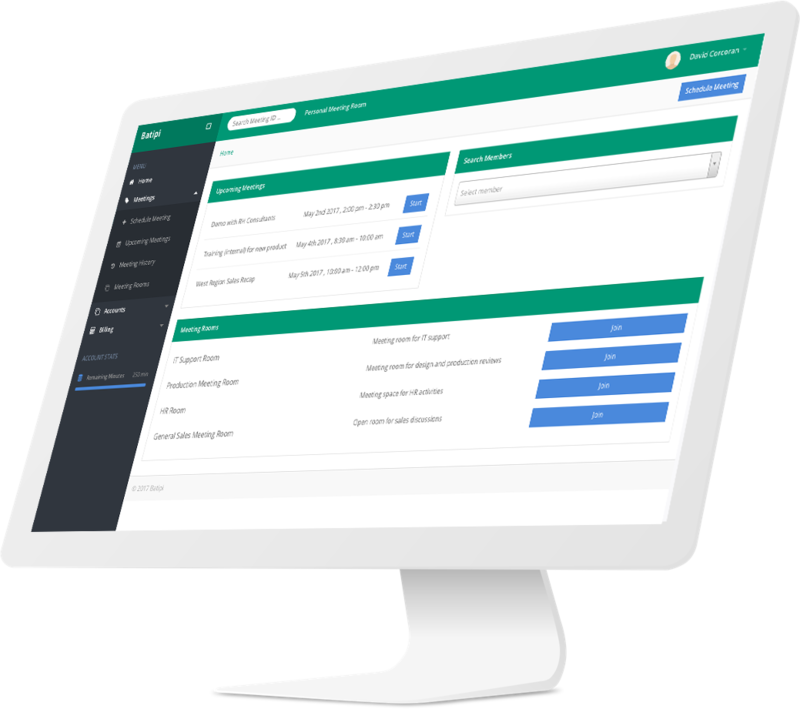 When you sign-up here you will have access to launch your own meetings, schedule meetings, add users, view reports & add manage billing for your company. Our company has an account, how do I access the service? Contact your account admin to be added to your organizations account. Or send us an email to help get your account connected. Do you offer audio and video peripherals for video conferencing? Yes we do. We're happy to point you to recommended devices that you can procure locally, or you can purchase direct from us. Can all users at our company use the video conferencing tool? Yes the pricing is based on usage as opposed to by user. Your free to add as many users throughout your company or association. Can we install software room systems in our conference room? Yes with a conference room subscription you can install the software on a MAC or PC. Do you offer professional services for installation? Yes. We provide onsite or remote install support. Including, design and install for your audio, video & visual components. Can we add our branding to your service? Yes we can customize many portions. Contact us to discuss further. Do you offer custom developed solutions for video conferencing API's? Yes our primary business is software development. Please reach out to discuss your requirements. Do you use other technologies for developing communication apps? We have worked with many developer platforms for integrating communication tools.